Temperature and humidity is recorded above and below ground as part of a research project investigating the carbon dynamics of a natural UK woodland. The School of Environmental Sciences at the University of Liverpool is running a research project investigating the role of natural woodland in the national budget of carbon emissions and sequestration. 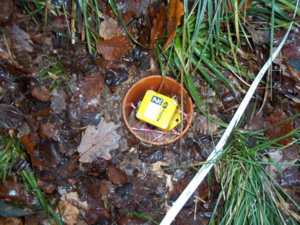 Tinytag Plus 2 temperature and humidity loggers are being used to monitor above and below ground over a period of two years in a forested National Nature Reserve in the Wye Valley. Four loggers are deployed, two recording air temp/RH, and two buried about 5cm below the soil surface. The recorded data is compared with the rates of decomposition of tree roots to see if temperature and humidity changes influence these rates. It is also used to compare soil and air temperatures to understand woodland microclimates. Professor of Environmental Sciences Richard Bradshaw, comments, "I have found the Tinytags to be reliable and robust, with a long battery life. They are easy to use and the Tinytag Explorer software is very versatile in displaying the recorded data.